Prayer of Pierre Viret, a Swiss Reformer, asking the Holy Spirit’s help for us to understand the truth and obey it. “Recognizing our faults and imperfections, and that we have nothing of ourselves that we did not receive from above, we humble ourselves before the high majesty of our good God and Father, full of goodness and mercy, praying to Him that He would not enter into judgment with us so as to punish us and correct us in His anger and fury [Psalm 6] in regard to our faults and iniquities, but that instead he would look upon the innocence, righteousness and obedience of His Son, Jesus Christ, whom He gave over to death for us. In this way may we learn to renounce ourselves, so that we no longer follow any idolatry, superstition or wicked carnal affections, so that we may fully place all our trust in Him, and consecrate ourselves and confirm ourselves completely to His holy will. Hence, may we know the favour of our Lord Jesus Christ, so that we may be found irreproachable and without spot before His face. Quoted from Systematic Theology, Vol. 1 by Douglas F. Kelly (Mentor, 2008) 26. Remember our friends, brothers and sisters, and the people of Myanmar and China in our prayer. Updates and photos can be seen at msnbc.com. 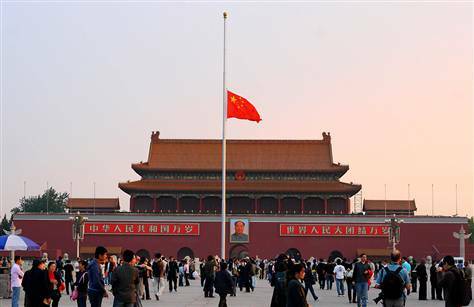 China mourns for those who died in the massive earthquake.